Cellulite, the biggest problem of 90% women and it’s just about a cosmetic problem, the way it looks not about a medical condition. It’s more common among women but even men can have it. It happens to different ages and different weights, even thin people have cellulite. But how to get rid of it and don’t worry anymore to wear a mini dress or bikini? First of all like every problem, to find the right solution you have to know the causes of it. Changing and improving the causes is the first step of getting rid of cellulite. What is cellulite and which are the factors that cause it? 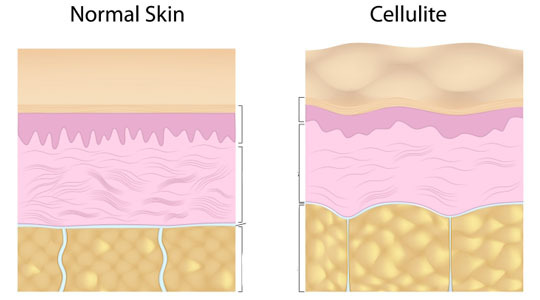 Cellulite is fat accumulated beneath the skin tissue giving that lumpy, dimpled appearance. It’s also related with the blood vessels, when blood isn’t flowing properly, there are more possibilities to cause cellulite. It’s also known as orange peel syndrome and is most common in buttocks, thighs an belly. It’s not harmful, it just gives you that ugly appearance and affect your confidence and self esteem. Grade 1. It just started, it’s not visible with the naked eye but an examination of cells can detect it. Grade 2. The skin looses its elasticity and the first signs are visible. Try hard to maintain this condition and not to pass to the thirds grade which is more difficult to get rid. Grade 3. Cellulite is visible and has that orange peel look. The skin looks dimpled regardless if you are sitting or standing and always when you pinch it. Lifestyle factors. A sedentary life, those that have an office job, those that do not exercise are more predisposed to have cellulite. Poor diet. An unhealthy diet with too many carbohydrates, fat and salt is a big enemy of cellulite. Smoking and alcohol affect on it to. Hormonal factors. Hormones play an important role in creating cellulite. Hormones like estrogen, prolactin and thyroid hormones influence on it. That’s because the cellulite appear in puberty. Weight. Even though cellulite appears in fat or skinny people, weight matters. As cellulite is fat deposit, more fat you have, more you are risked to have cellulite to. Dehydration. Not getting enough fluid in your diet, contribute in cellulite development. So you should drink around 2 liters of water a day and it cannot be substitute with soda or another drinks. Water is the best to stay hydrated. Thickness and color of your skin. Cellulite is less noticeable on darker skin so before going out in a bikini apply a self tanner to make the dimples and the bumps less noticeable. Cellulite treatments and how to get rid of it? As we mention the factors that cause it, keep in mind to not allow those factors to develop your problem. Eat healthy, lean protein, good fat, not processed foods and drink a lot of water. Also exercising is very important, get a combination of cardio workout and strength training, to get your blood flowing and build stronger muscles. Massage is very important and can really improve their appearance. They don’t remove it totally but helps to decrease it. Use anti-cellulite creams or gels and massage it on your own or go to a spa for a professional treatment. Home remedies works well on reducing it. Make a scrub once or twice a week and apply a composition of coffee ground and olive oil. The caffeine properties are proved that works well on anti-cellulite treatment. Or after doing a bath, wash your problematic areas with cold water, to improve your liquid circulation ant to tone up your body. Also retinol creams has been shown to improve the appearance of cellulite after few months. If you really proved all and are not satisfied with the result you can always ask for a surgical help. A technique that is very used nowadays is Liposuction. This procedure removes fat deposits beneath the skin tissue and improves the cellulite appearance. It’s used a lot by celebrities but also by common people. Mesotherapy is another surgical procedure which consists on injecting amino acids, vitamins, minerals and enzymes into the tissue. This method breaks down fat and improves significantly the appearance of the problematic area. But it can cause unwanted effects like rashes, swelling and bumpy skin contours, so be sure before applying it. Laser treatments are probably the most promising therapy that reduces cellulite. The radiofrequency and the infrared light melt the fat under the skin and stimulate collagen production. After a series of treatments the result are visible and can last up to six months. It’s never too late to start treating cellulite problem. Start from changing little habits on your lifestyle, think positive, be patient and optimistic. You will be surprised by the results.